Every person has the fundamental right to obey the dictates of their own conscience. The First Amendment covers the individuals right to conscience. We can say, think, believe, and write what we like and express those thoughts in public and to the government without fear of reprisals. The Constitution and its Amendments specifically relate to government and in particular to the Federal government. This amendment expresses the fundamental belief of Americans that says: what I feel in my conscience is correct, I have the right to express without fear of government. These people are protesting the government right in front of the White House in Washington D.C. The First Amendment controls the government and keeps it from shutting down protests by arresting people, attacking them through economic means, or using physical violence. Photo by SLOWKING, GFDL v1.2 licence, Wikimedia. That right of expression is not a common one. People who have power (as in government) want to keep that power. They understand a truth that many of us forget too often. It is always the People who ultimately have the power. If you speak out against a government policy or person in power and enough people listen to you and believe you and also begin to speak out you can topple the policy, person, or entire government with not much more than the powerful force of opinion. No policy can possibly exist in a place where people refuse to abide by it. That’s exactly why governments eventually, if not at first, punish and silence dissenters. They ban religion or establish a state religion for the same reasons: people are easier to control if you control not only their civic behavior but also their conscience. Read the First Amendment and explain what the First Amendment means in your own words to your kids. Choose a court case involving the First Amendment, explain the two sides of the argument and discuss it with your kids. The discussion length and level will depend on the ages of the kids, but even a third grader should be able to get it if you explain clearly. United States Vs. Eichman (1990) is a case about flag burning that would be understandable for younger kids up though teens. Ask the kids about whether they agree or disagree with the court’s conclusions. Demand that they explain why. As the teacher you don’t necessarily have to give your opinion at all. Your job is to make them think deeply about it. You might point out though how fascinating it is that in a case between an individual and the government, the government ruled against itself . . . that is what is meant by the Rule of Law. 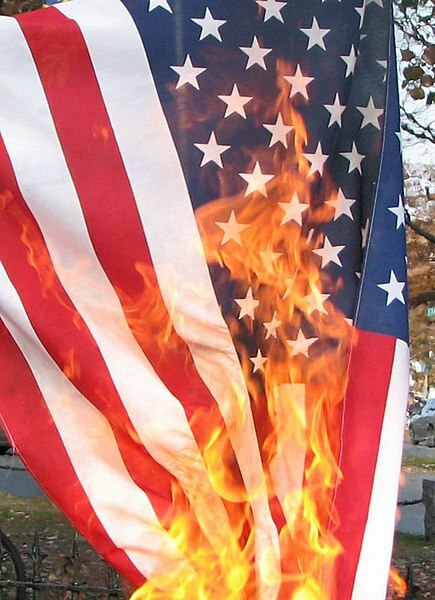 A US flag being burned in protest just before the 2008 election. Some people think flag burning is not a legitimate form of free speech. Photo by Jennifer Parr, CC license. Compare the above flag burning case to a 2010 news story of kids at a California school who were asked to remove T-shirts depicting the American Flag. How are the cases related? How are they different? Are they both First Amendment cases? The flag t-shirt case isn’t quite as clear cut as you may think. The school administration was afraid of disruption and perhaps violence because the t-shirt was purposely worn as a statement on a Mexican pride day. Where does free speech begin and school’s need for order end and vice versa? Learn about some stories from history where the rights we enjoy in the First Amendment were not given to certain people or groups with tragic results: St. Bartholomew’s Day Massacre, Missouri Executive Order #44, Imprisonment of Galileo, Stalin’s Great Purge, French Reign of Terror, Alien and Sedition Acts (1798), Sedition Act (1918), Tianenmen Square, many many more. Older kids can read one of these stories, and write an essay explaining how the situation relates to First Amendment Principles and what the consequences of both the allowance of free speech and the restriction of it would be in the case. They should also express their opinion of the event as related to the First Amendment. 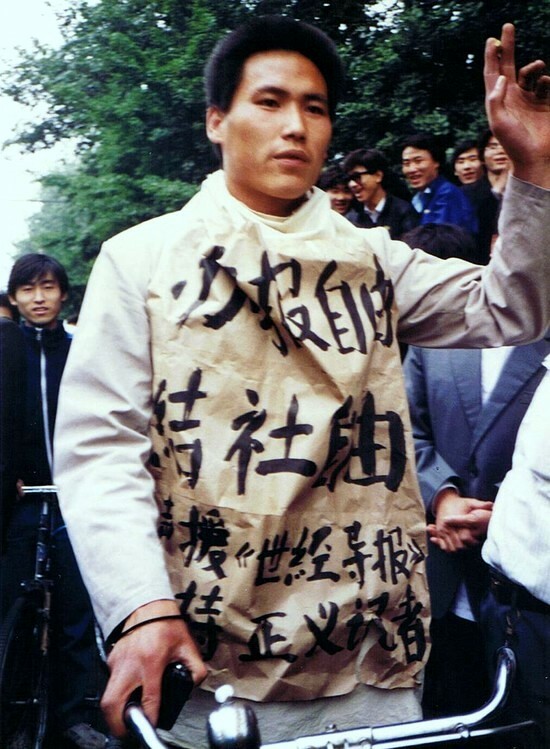 In 1989 this young man and roughly a million other people converged on the large plaza in the center of Beijing known as Tienanmen Square. One of their main demands was freedom of speech. The military brutally put down the protest with 30,000 troops. Though the protesters far outnumbered the military the people of China have long been disarmed. Thousands of people were killed and wounded. Very few people in China today remember the incident because the government has heavily censored all mention of it. Photo by 蔡淑芳@sfchoi8964 and uploaded to the Chinese Wikipedia, CC license. Make a poster with the First Amendment written in the center. Around the outside place images that remind the students of why the First Amendment is important. You might have pictures representing some of the atrocities (or just uncomfortable situations) caused by government suppression of conscience. Or images showing people exercising their first amendment rights such as the civil rights sit-ins, people at a political rally, people attending a religious meeting, an image of someone reading a banned book, and so on. Finally the First Amendment is really complicated. Point out some of the problems: Does the First Amendment apply only to political speech or all speech? Does it apply only to the Federal government or all government? What if the speech hurts someone else? How do you define if it hurts someone else? What if the speech is traitorous or seditious? Should all religious practices be protected even if they are contrary to societies norms (like drug use, polygamous marriage, devil worship, self mutilation, and other strange rites)? Can speech be restricted in some places? Do private businesses or organizations have the right to restrict speech on private property? Do public schools have the right to restrict some forms of speech in their halls? Does the government have either the right or the responsibility to ban religious speech in any form from all government premises? Is it more important to protect freedom of conscience or to protect the norms and values of society? What are the consequences of any of the above allowances or restrictions? Just because you can say something doesn’t mean you should. Self-restraint is a vital part of civil society. Educate your children’s morals as well as their minds. Current events are riddled with references to the First Amendment. Pay attention to the world around you and discuss the issues of the day with your kids. Most countries today have some sort of guarantee of free speech. Choose a country and research their take on political speech. See if they actually abide by the spirit of their own laws or not. Perhaps the most important part of understanding the First Amendment is understanding that it applies just as much to speech you don’t like as it does to speech you do like. Politically correct speech is a way to control the speech and ultimately the thoughts of people so that only one side of the debate is acceptable. Recently I saw a news article of a man in Great Britain who was actually arrested for doing nothing more than speaking his mind in public. See if you can find examples of speech being curtailed in countries we all thought were free. And pay attention to your own attitudes about speech you don’t like. Teach your kids about the 2nd Amendment. Help your kids foster a sense of love for their country with patriotic music. I used to love teaching this! Btw, you got a new blog design, right? I love it!